2 players across the top. 2 players across the middle. - Open up the middle for the two and three man game. - Leaves man-to-man defense with no crease slide. - Can lead to lots of passing without attempts to score. The Circle 2 Set creates more opportunity for the 2 man game than the Circle 1 does. All the offense players have good space and are positioned to drive and be a threat to score within a few steps. This helps the 2 man game work by creating looks for back door cuts. A Circle offense confuses a typical crease-sliding defense and forces the adjacent slides. When the adjacent slide goes this often leaves the adjacent offense player open for a back door cut, and the ball carrier can draw and dump to feed the cutter to score. 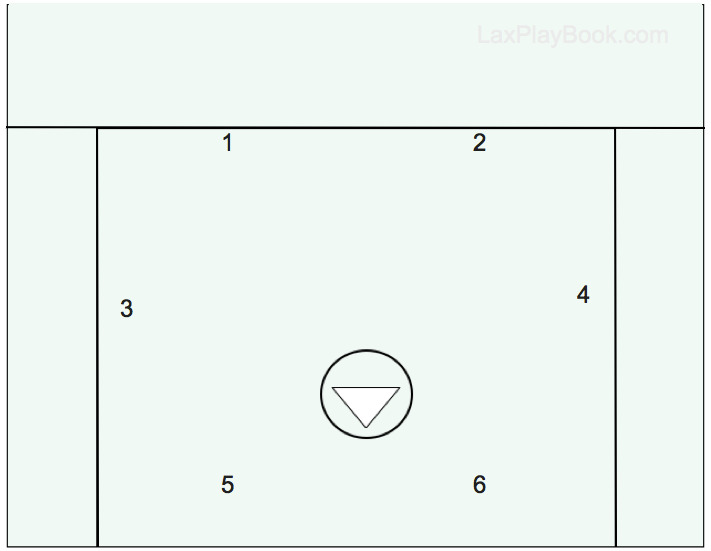 The Circle 2 Set opens up a huge area for cutters from the back-side of the offense, especially through the middle, and forcing the adjacent slides also opens up large areas for good outside shooters to take advantage of. A Circle offense is more of a free-flowing offense with dodges occurring all over the offensive end and cutters coming from all areas. Dodges can occur from anywhere in a Circle offense and should occur regularly to force the defense to slide actively. It is very easy for the defense to lose track of their matchups this way. This is a great set for teams who only have 1-2 strong dodgers. In a Circle 2 even the weaker dodgers can cut and contribute to the chaos, so it masks their shortcomings as well as gives them experience to develop and improve. Meanwhile, bringing the 2 stronger dodgers behind GLE will force the defense to slide and respond, clearing space for the offense up top, creating outlets, and ensuring a player will get the line for a shooting lane. The Circle 2 Offense works well combined with a 2-2-2 Offense since it is easy to switch between the 2; to alternate the 2 players across the middle just meet at the crease or go back to the wings. Against a zone defense circle offense does little, however the 2 man game can be used to attack and overload a corner zone. Since the crease zone defenseman would stay in position to make a slide the finish would still need to come from an additional offense teammate. Teams can be fabulous at passing the ball around the circle without making attempts to score, so the offense needs to be sure to keep making off-ball pick plays and cuts through the middle. The coach should have a few calls ready to initiate plays especially with younger teams.